If you're looking for both principal appreciation and a growing stream of quarterly cash payments, you might like these two stocks. One of the best benefits of investing in stocks is that some of them not only appreciate in value, but also pay out cash on a quarterly basis to shareholders. On this note, here are two stock ideas likely to provide investors with both principal appreciation and meaningful quarterly dividend payments over the next five years: PepsiCo (NASDAQ:PEP) and General Electric (NYSE:GE). Between its substantial beverage segment and its market-leading snack business, Pepsi consistently delivers for investors. Indeed, for the last 10 years, Pepsi's return on equity has been 29% or higher. 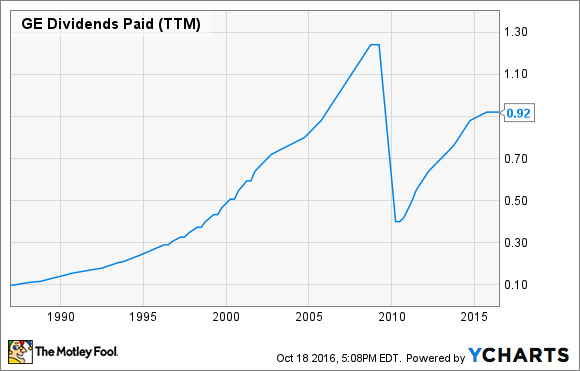 These types of returns have enabled Pepsi to pay out a meaningful and growing dividend for a whopping 44 years. Today, Pepsi stock has a dividend yield of 2.8%. And the dividend looks set for further healthy growth. Not only has the dividend increased at an average annualized rate of 7.9% during the past five years, but the company is paying out just 63.8% of its earnings in dividends, leaving room for further increases as long as the company can maintain current levels of earnings per share. Going forward, Pepsi's expansive bottling and distribution network, brand awareness, and entrenched relationships with major retailers should help the company continue to drive healthy returns for investors. Here's a crazy statistic for you: General Electric has paid a dividend each quarter for over 100 years. Talk about a solid track record. Further, despite its age, GE's dividend has grown at rapid rates in recent years, increasing at an average rate of about 15% during the past five years. One weakness to GE's dividend, however, is the company's relatively high payout ratio. Already paying out about 86% of earnings, the company will need to continue growing earnings over the long haul in order to keep increasing its dividend. With this payout ratio in mind, it's fair to expect GE's dividend growth during the next five years to be slower than it was in the previous five years. Further, GE's dividend history isn't entirely rosy. The recession hit GE's financing business, GE Capital, particularly hard -- and the company subsequently cut its dividend during this period. GE Dividends Paid (TTM) data by YCharts. But GE has since strategically positioned its business for both growth and risk aversion. Today, the company is made up of a very diversified and reliable set of manufacturing businesses, spanning a range of industrial segments, including power and water, aviation, transportation, oil and gas, energy management, healthcare, and lighting. In addition, the company's GE Capital division is now more focused, positioned to profitably serve specialty finance areas. GE's diversified set of powerful and profitable assets, backed by an intelligent software-supported ecosystem, gives the company a competitive edge in the different segments it operates in, and should help drive a rising stock price over the long haul. Both of these dividend stocks, fortunately, have solid dividend yields, but GE's dividend yield of 3.2% is slightly higher than Pepsi's 2.8% yield, helping make up for its comparatively lackluster growth potential. However, both stocks have their strengths. Pepsi stands out as the dividend stock with greater growth potential, and GE has a higher dividend yield today.